I’ve been at home for the last week after six weeks travelling around the UK and elsewhere. I’ve not kept up while on the road so doing a retrospective post on it all and need to try to catch on other half written posts. As well as time at Talis offices in B’ham and at Lancs (including exam board week), travels have taken me to Pisa for a workshop on ‘Supportive User Interfaces’, to Koblenz for Web Science conference giving a talk on embodiment issues and a poster on web-scale reasoning , to Newcastle for British HCI conference doing a talk on fridge, to Nottingham to give a talk on extended episodic experience, and back to Lancs for a session on creativity! Why can’t I be like sensible folks and talk on one topic! Monday 13th June I attended a workshop in Pisa on “Supportive User Interfaces“, which includes interfaces that adapt in various ways to users. 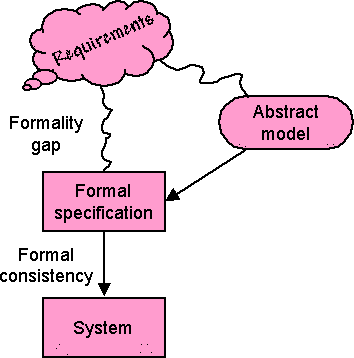 The majority of people there were involved in various forms of model-based user interfaces in which various models of the task, application and interaction are used to generate user interfaces on the fly. W3C have had a previous group in this area; Dave Raggett from w3c was at the workshop and it sounds like there will be a new working group soon. This clearly has strong links to various forms of ‘meta-level’ representations of data, tasks, etc.. My own contribution started the day, framing the area, focusing partly on reasons for having more ‘meta-level’ interfaces including social empowerment, and partly on the principles/techniques that need to be considered at a human level. Also on Monday was a meeting of IFIP Working Group 2.7/13.4. IFIP is the UNESCO founded pan-national agency that national computer societies such as as the BCS in the UK and ACM and IEEE Computer in the US belong to. Working Group 2.7/13.4 is focused on the engineering of user interfaces. I had been actively involved in the past, but have had many years’ lapse. However, this seemed a good thing to re-engage with with my new Talis hat on! Jaime Teevan from Microsoft gave the opening keynote at WebSci 2011. I know her from her earlier work on personal information management, but her recent work and keynote was about work on analysing and visualising changes in web pages. Web page changes are also analysed alongside users re-visitation patterns; by looking at the frequency of re-visitation Jaime and her colleagues are able to identify the parts of pages that change with similar frequency, helping them, inter alia, to improve search ranking. Had many great conversations, some with people I know previously (e.g. the Southampton folks), but also new, including the group at Troy that do lots of work with data.gov. I was particularly interested in some work using content matching to look for links between otherwise unlinked (or only partly inter-linked) datasets. Also lots of good presentations including one on trust prediction and a fantastic talk by Mark Bernstein from Eastgate, which he delivered in blank verse! My own contribution included the poster that Dave@Talis prepared, which was on the web-scale spreading activation work in collaboration with Univ. Athens. Quite a niche area in a multi-disciplinary conference, so didn’t elicit quite the interest of the social networking posters, but did lead to a small number of in depth discussions. In addition I gave talk on the more cognitive/philosophical issues when we start to use the web as an external extension to / replacement of memory, including its impact on education. Got some good feedback from this. Closing keynote was from Barry Wellman, the guy who started social network analysis way before they were on computers. At one point he challenged the Dunbar number1. I wondered whether this was due to cognitive extension with address books etc., but he didn’t seem to think so; there is evidence that some large circles predate web (although maybe not physical address books). Made me wonder about itinerant tradesmen, tinkers, etc., even with no prostheses. Maybe the numbers sort of apply to any single content, but are repeated for each new context? I attended the British HCI conference in Newcastle. This was the 25th conference, and as my very first academic paper in computing2 was at the first BHCI in 1984, I was pleased to be there at this anniversary. 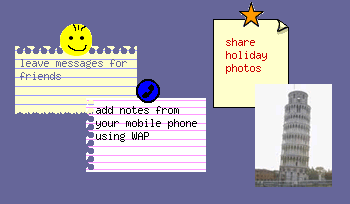 The paper I was presenting was a retrospective on vfridge, a social networking site dating back to 1999/2000, it seemed an historic occasion! As is always the case presentations were all interesting. Strictly BHCI is a ‘second tier’ conference compared with CHI, but why is it that the papers are always more interesting, that I learn more? It is likely that a fair number of papers were CHI rejects, so it should be the other way round – is it that selectivity and ‘quality’ inevitably become conservative and boring? Gregory Abowd gave the closing keynote. It was great to see Gregory again, we meet too rarely. The main focus of his keynote was on three aspects of research: novelty, value and reliability and how his own work had moved within this space over the years. In particular having two autistic sons has led him in directions he would never have considered, and this immediately valuable work has also created highly novel research. Novelty and value can coexist. Gregory also reflected on the BHCI conference as it was his early academic ‘home’ when he did his PhD and postdoctoral here in the late 1980’s. He thought that it could be rather than, as with many conferences, a second best to getting a CHI paper, instead a place for (not getting the quote quite perfect) “papers that should get into CHI”, by which he meant a proving ground for new ideas that would then go on to be in CHI. However I initially read the quote differently. BHCI always had a broader concept of HCI compare with CHI’s quite limited scope. That is BHCI as a place that points the way for the future of HCI, just as it was the early nurturing place of MobileHCI. However CHI has now become much broader in it’s own conception, so maybe this is no longer necessary. Indeed at the althci session the organisers said that their only complaint was that the papers were not ‘alt’ enough – that maybe ‘alt’ had become mainstream. This prompted Russell Beale to suggest that maybe althci should now be real science such as replication! Gregory also noted the power of the conference as a meeting ground. It has always been proud of the breadth of international attendance, but perhaps it is UK saturation that should be it’s real measure of success. Of course the conference agenda has become so full and international travel so much cheaper than it was, so there is a tendency to go to the more topic specific international conferences and neglect the UK scene. This is compounded by the relative dearth of small UK day workshops that used to be so useful in nurturing new researchers. I feel a little guilty here as this was the first BHCI I had been to since it was in Lancaster in 2007 … as Tom McEwan pointed out I always apologise but never come! However, to be fair I have also only been twice to CHI in the last 10 years, and then when it was in Vienna and Florence. I have just felt too busy, so avoiding conferences that I did not absolutely have to attend. In response to Gregory’s comments, someone, maybe Tom, mentioned that in days of metrics-based research assessment there was a tendency to submit one’s best work to those venues likely to achieve highest impact, hence the draw of CHI. However, I have hardly ever published in CHI and I think only once in TOCHI, yet, according to Microsoft Research, I am currently the most highly cited HCI researcher over the last 5 years … So you don’t have to publish in CHI to get impact! I was at Mixed Reality Lab in Nottingham for Joel Fischer‘s PhD viva and while there did a seminar the afternoon on “extended episodic experience” based on Haliyana Khalid‘s PhD work and ideas that arose from it. Basically, whereas ‘user experience’ has become a big issue most of the work is focused on individual ‘experiences’ whereas much of life consists of ongoing series of experiences (episodes) which together make up the whole experience of interacting with a person or place, following a band, etc. 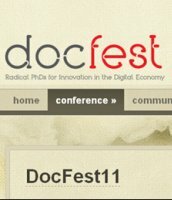 The last major event was Docfest, which brought together the PhD students from the digital economy centres from around the country. Not sure of the exact count but just short of 150 participants I think. They come from a wide variety of backgrounds, business, design, computing, engineering, and many are mature students with years of professional experience behind them. This looked like being a super event, unfortunately I was only able to attend for a day 🙁 However, I had a great evening at the welcome event talking with many of the students and even got to ride in Steve Forshaw‘s Sinclair C5! My contribution to the event was running the first morning session on ‘creativity’. Surprise, surprise this started with a bad ideas session, but new for me too as the largest group I’ve run in the past has been around 30. There were a number of local Highwire students acting as facilitators for the groups, so I had only to set them off and observe results :-). At the end of the morning I gave some the theoretical background to bad ideas as a method and in understanding (aspects of) creativity more widely. Other speakers at the event included Jane Prophet, Chris Csikszentmihalyi and Chris Bonnington, so was sad to miss them; although I did get a fascinating chat with Jane over breakfast in the hotel hearing about her new projects on arts and neural imaging, and on how repetitious writing induces temporary psychosis … That is why the teachers give lines, to send the pupils bonkers! If life is always a learning opportunity, then so are dreams. Last night I both learnt something new about language and cognition, and also developed a new trick for creativity! In the dream in question I was in a meeting. I know, a sad topic for a dream, and perhaps even sadder it had started with me filling in forms! The meeting was clearly one after I’d given a talk somewhere as a person across the table said she’d been wanting to ask me (obviously as a sort of challenge) if there was a relation between … and here I’ll expand later … something like evolutionary and ecological something. Ever one to think on my feet I said something like “that’s an interesting question”, but it was also clear that the question arose partly because the terms sounded somewhat similar, so had some of the sense of a rhyming riddle “what’s the difference between a jeweller and a jailor”. So I went on to mention random metaphors as a general creativity technique and then, so as to give practical advice, suggested choosing two words next to each other in a dictionary and then trying to link them. Starting with the last of these, the two words in a dictionary method is one I have never suggested to anyone before, not even thought about. It was clearly prompted by the specific example where the words had an alliterative nature, and so was a sensible generalisation, and after I woke realised was worth suggesting in future as an exercise. But it was entirely novel to me, I had effectively done the exactly sort of thinking / problem solving that I would have done in the real life situation, but while dreaming. One of the reasons I find dreams fascinating is that in some ways they are so normal — we clearly have no or little sensory input, and certain parts of our brain shut down (e.g. 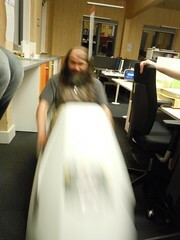 motor control to stop us thrashing about too much in our sleep) — but other parts seem to function perfectly as normal. I have written before about the cognitive nature of dreams (including maybe how to model dreaming) and what we may be able to learn about cognitive function because not everything is working, rather like running an engine when it is out of the car. In this dream clearly the ‘conscious’ (I know an oxymoron) problem-solving part of the mind was operating just the same as when awake. Which is an interesting fact about dreaming, but I was already aware of it from previous dreams. In this dream it was the language that was interesting, the original conundrum I was given. The problem came as I woke up and tried to reconstruct exactly what my interlocutor had asked me. The words clearly *meant* evolutionary and ecological, but in the dream had ‘sounded’ even closer aurally, more like evolution and elocution (interesting to consider, images of God speaking forth creation). So how had the two words sound more similar in my dream than in real speech? For this we need the Jabberwocky circuit. There is a certain neurological condition that arises, I think due to tumours or damage in particular areas of the grain, which disrupts particular functions of language. The person speaks interminably; the words make sense and the grammar is flawless, but there is no overall sense. Each small snippet of speech is fine, just there is no larger scale linkage. When explaining this phenomenon to people I often evoke the Jabberwocky circuit. Now I should note that this is not a word used by linguists, neurolinguists, or cognitive scientists, and is a gross simplification, but I think captures the essence of what is happening. Basically there is a part of your mind (the conscious, thinking bit) that knows what to say and it asks another bit, the Jabberwocky circuit, to actually articulate the words. The Jabberwocky circuit knows about the sound form of words and how to string them together grammatically, but basically does what it is told. The thinking bit needs to know enough about what can be said, but doesn’t have time to deal with precisely how they are strung together and leaves that to Jabberwocky. Even without brain damage we can see occasional slips in this process. For example, if you are talking to someone (and even more if typing) and there is some other speech audible (maybe radio in the background), occasionally a word intrudes into your own speech that isn’t part of what you meant to say, but is linked to the background intruding sound. Occasionally too, you find yourself stopping in mid sentence when the words don’t quite make sense, for example, when what would be reasonable grammar overlaps with a colloquialism, so that it no longer makes sense. Or you may simply not be able to say a word that you ‘know’ is there and insert “thingy” or “what’s it called” where you should say “spanner”. The relationship between the two is rather like a manager and someone doing the job: the manager knows pretty much what is possible and can give general directions, but the person doing the job knows the details. Occasionally, the instructions get confused (when there is intruding background speech) or the manager thinks something is possible which turns out not to be. Going back to the dream I thought I ‘heard’ the words, but examining more closely after I woke I realised that no word would actually fit. I think what is happening is that during dreaming (and maybe during imagined dialogue while awake), the Jabberwocky circuit is not active, or not being attended to. It is like I am hearing the intentions to speak of the other person, not articulated words. The pre-Jabberwocky bit of the mind does know that there are two words, and knows what they *mean*. It also knows that they sound rather similar at the beginning (“eco”, “evo”), but not exactly what they sound like throughout. I have noticed a similar thing with the written word. Often in dreams I am reading a book, sheet of paper or poster, and the words make sense, but if I try to look more closely at the precise written form of the text, I cannot focus, and indeed often wake at that point1. That is the dream is creating the interpretation of the text, but not the actual sensory form, although if asked I would normally say that I had ‘seen’ the words on the page in the dream, it is more that I ‘see’ that there are words. Anyway, I am awake now and the wiser. I know a little more about dreaming, which cognitive functions are working and which are not; I know a little more about the brain and language; and I know a new creativity technique. Not bad for a night in bed. What do you learn from your dreams? I have just finished reading Schön’s “The Reflective Practitioner“. It is one of those books that you feel you ought to have read years ago, resonating so much with many of my own thoughts and writing about creativity and innovation. However, I found myself at odds slightly with the adversarial dualism between science and practice, but realise this is partly because it is a book of its time. I will return to this later. I am in Eindhoven doing CSCW, silly ideas and other things with the USI students here. 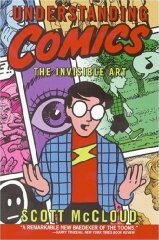 On the book shelf here is Scott McCloud’s “Understanding Comics” I picked this up last year and couldn’t put it down until I had read it all. 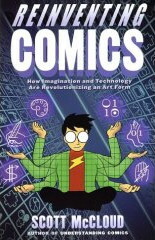 There is another book on the shelves this year “Reinventing Comics” and I daren’t pick it up until I’ve done all the work I want to today! Understanding Comics is both an apologetic for comics as an art form and also an exploration into what makes a comic a comic and how comics manage to captivate and give a sense of narrative and action through what are basically static images. As well as being a good read about comics and about art there seem to be many lessons there for other forms of narrative and animation especially on the web. As far as I can see (without starting to read it and not being able to stop), Reinventing Comics seems to be about the way online delivery trough the web is giving new opportunities for Comic art … but maybe when I finish everything today I will find out. Less graphic and less fun, but no less fascinating, I have been dipping into chapters of “The Psychology of Problem Solving“, which was also sitting on the USI shelves. I was particularly enthralled by descriptions of experiments where subjects were asked to accomplish divergent thinking tasks whilst either pushing their palms upwards from under a table, or pushing down from on top. The former a positive, ‘come to me’ gesture elicited more diverse ideas than the latter, negative, ‘go away’ gesture, even though the only difference was the muscle groups in tension. I’ve seen other research that shows how our brains monitor our body state to ‘see how we feel’ (like smiling therapy), but this was one of the most subtle and conclusive. During the week I have had the USI students work through a design brief starting with silly ideas then moving through structured analysis to good ideas. Perhaps I should have had them pushing up on tables in the first part and down in the second? The article gathers loads of anecdotal evidence of creativity in dreams … including, inevitably, those benzine rings! Personally … while I’m sure that some things happen unconsciously and during sleep, my guess is that 90% of these creativity stories have simpler reasons through selective memory or semi-random inspiration.